In DotCom Secrets, you learned what sales funnels are, and how they can help you sell your products online. If you haven’t finished reading DotCom Secrets yet, then you should go ahead and do that. But if you have completed reading one of my favorite books, then you should follow that up by picking up Expert Secrets: The Underground Playbook For Creating a Mass Movement of People Who Will Pay For Your Advice. Russell Brunson’s Expert Secrets is an must-read book that shares the secrets of creating a loyal following of fans who will buy your products. Inside, you’ll find a comprehensive guide on how to become an expert in your niche and building a tribe of loyal followers, who resonate with your message and buy your products. That’s what Russell Brunson’s book, Expert Secrets is all about and in my opinion, its a must read book for any marketer and entrepreneur. Here is what I’m going to be covering in my Expert Secrets review. If you’re already ready to purchase Expert Secrets, then skip down to the bottom of this review to see my $911 Expert Secrets bonus offer before you do. 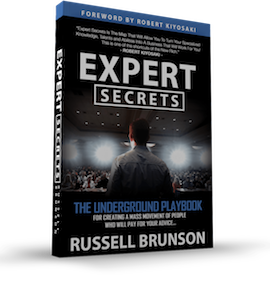 Expert Secrets is the follow-up to Russell Brunson’s best selling DotCom Secrets book. The book is all about creating your own following. How do you do this? By becoming an expert and coming up with a message that can change someone else’s life. In Russell’s trademark style, you’ll get plenty of examples and stories where he illustrates how he created his own loyal following that turned ClickFunnels into a $100 million business. At the time of this post, Expert Secrets has 4.5 stars and 168 customer reviews on Amazon. The book is aimed at people trying to run two types of businesses. The first, is someone who wants to sell info products directly. This could be selling an ebook, a course, coaching or consulting. The second type is someone who wants to leverage info products to grow their own business. This is what Russell did to grow ClickFunnel’s into a $100 million a year business. The beginning of the book is all about learning how to create your mass movement. Russell found that all mass movements have 3 things in common. To become a leader (or expert), you first need to figure out what market you want to serve. The 3 core markets to pick from are wealth, health and relationships. But under these three core markets are hundreds of submarkets. For example, under wealth topics that interest me include online marketing, stock market investing and bitcoin. What Russell emphasizes though is that these submarkets are still too broad. There is so much competition and it will be hard for you to stand out. So you need to drill down one more level into specific more niches. For example, if you were in the online marketing niche, you might decide to become an expert in writing daily emails, or marketing automation with ActiveCampaign. There’s less saturation in these niches which gives you an opportunity to find your own unique area to thrive. 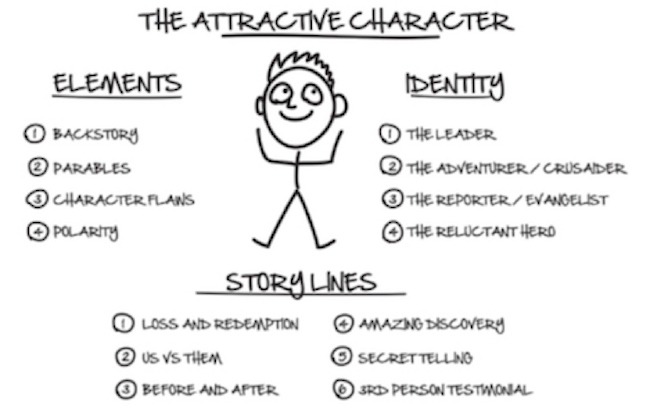 Once you’ve picked your niche, you can then move on to developing your Attractive Character. Once that’s in place, it makes building your movement a lot easier because you can create your content and funnels based around it. By the end of this section, you’ll know exactly who you want to work with, how to reach them, and what you need to do to deliver the results they want. This section focuses on how to learn how to understand the minds of your followers to turn them into customers. Russell starts off this section focusing on your “One Thing” aka “The Domino”. It’s the one thing you need to get someone to believe that will knock down all of their objections. Once you figure out your “one thing” the way he explains it, it will change the way you do business. Next, in order to better connect with your audience, Russell talks about coming up with your “the Epiphany Bridge”. This is the story that takes your audience though the emotional experience that got you excited about the opportunity you are sharing with them. And if you tell this story about how you got your own “aha” moment, and structure it in the way that Russell explains, then your audience will have the same epiphany themselves about whatever you are talking about. This will get them excited to learn more about it on their own, and most importantly, get them excited to buy. I love this part of the book, because this is where Russell teaches you the framework to becoming a better storyteller. You’ll learn about the “kinda like” bridge to help you simplify more complex concepts and how to get people to “feel” when listening to your stories. Next you’ll learn about a story framework called The Hero’s 2 Journeys and it’s a formula that movies have been following for years. It’s a proven structure you can use for any story you want to tell. However, Russell has simplified the whole process into what he called the Epiphany Bridge Script. What’s cool is that you just answer the 8 questions that he has come up with, and it will essentially write the story for you itself. The next section of the book is all about taking what you learned in the first two sections and converting that into sales. 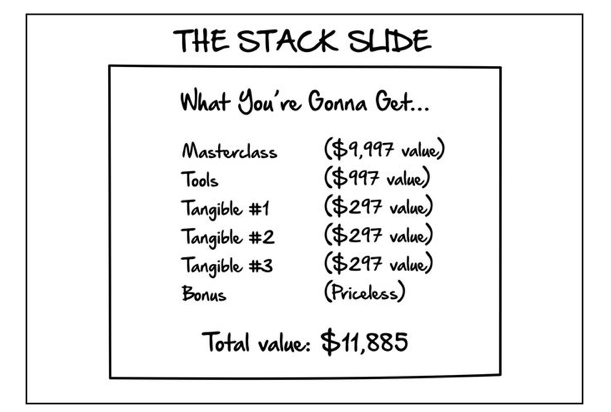 The main idea that Russell talks about here is the Stack Slide which helps you increase the overall value of your product. The Stack Slide is crucial to your marketing, especially when used on a sales page or inside a webinar. Russell shows you how to effectively build your own and make it into your irresistible offer. Once you have this in place, you can sell it via an online webinar. Webinars are probably the best method to sell your product because you can run multiple webinars per day, as often as you’d like. And they don’t necessarily have to be live events. You can actually just do a single presentation and have it sell for for months. Russell has spent years doing live webinars so he could perfect the formula over time. Once he got it right, he was able to make consistent sales day in and day out, netting him millions of dollars. 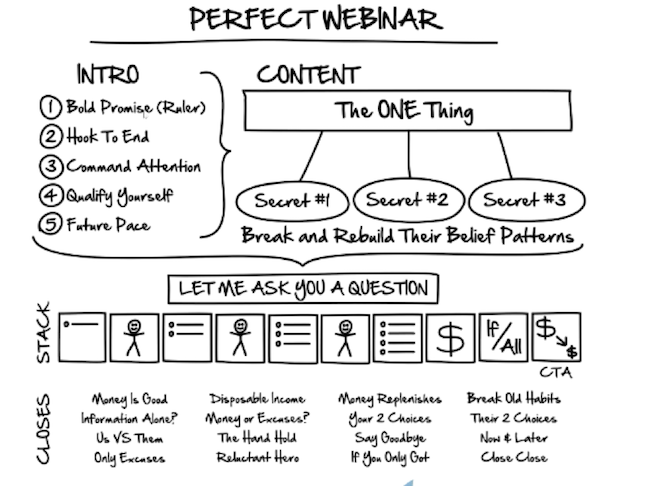 This is what he called the Perfect Webinar, and he goes into great detail of how this works. You’ll learn how to structure your webinar to take a prospect from a state of interest to the point where they are ready to fork over their money for the value you are providing them. Regardless of the product, you can use this script to explain how valuable your product is to your customer (assuming it actually is valuable) and how to market it correctly throughout your webinar. If you’ve been on any marketing related webinars recently, you probably have already seen the Perfect Webinar in action. That’s because it works and it’s pretty easy for even beginners to pick up. You can find the paperback edition of Expert Secrets on Amazon selling for $13.56. Or you can grab the Kindle version for $8.69. However, if you want to get a pretty big discount, Russell is giving away Expert Secrets for free if you buy through his website. All you have to do is pay shipping and handling, which comes out to $7.95. I really do recommend going through the main site to buy the book. Because you’ll get to see directly one of the most successful sales funnels out there, and experience some of the lessons first hand that you’ll learn in the book. Plus you’ll be able to purchase the Expert Secrets audiobook through the funnel as well, if you prefer that medium instead. I thoroughly enjoyed Expert Secrets. It was packed with actionable advice, that I’ve been able to use myself for building my own brand and following in my own Facebook group: Affiliate Profits Mastermind. By developing a following of crazy fans, you’re ensuring that you can build a defensible moat around your business. You’re no longer at the mercy of other platforms like Facebook or Google. Instead, you have people following every word you say, and buying when you want them too. And that’s very powerful stuff, which is why you should take the time to read Expert Secrets. Did my Expert Secrets review get you interested in reading the book? I have some exclusive Expert Secrets bonuses for anyone who picks up a copy of the book using my link. To get this Expert Secrets bonus offer, use this link and then email me here with your receipt and I will send you the bonuses within 24 hours. Affiliate Disclaimer: I hope you enjoyed our Expert Secrets review. Please note that some of the links inside this article may be affiliate links for Expert Secrets. That means that if you click on one of the links and sign up, we may get an affiliate commission for it. If you do happen to click, we really appreciate it! Any money we make keeps this site running smoothly and allows us to keep producing these high-quality reviews. Russell gives all this great info – targeted to online consultants – to sell more ClickFunnel subscriptions, of course. I have read Dot Com Secrets. And I’ve used ClickFunnels as an SEO Agency (Lionheart SEO) and as a professional (www.lisachapman.com). I started with CF when it was still fairly new in 2015, and I found it to be too technical for me, so I moved on. But even today, my clients still find it tedious and frustrating. As a DIY solution, my SEO clients want point-and-click tools.